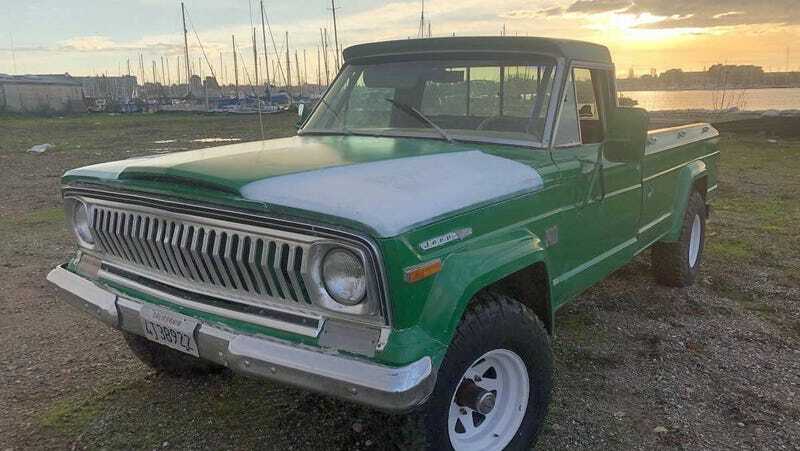 At $5,990, Could This 1973 Jeep J4000 Long Bed be on Your Short List? Today’s Nice Price or Crack Pipe Jeep pickup is said to have been built for bounding over Baja. With a 54-gallon gas tank and a cabin cage, you could probably take it pretty much anywhere. That is, is you can take its price tag. Do you think it’s better to buy a cheap version of an expensive car, or the priciest edition of a cheap car? That’s a conundrum for the ages, but one that we really don’t have time to debate right now. Instead we need to look back on Friday’s 2000 Volkswagen GTI GLX VR6, which admittedly represented the latter of those two options. Being a top of the line for what at the time was an entry-level model (the Golf) it did come with a lot of kit. Considering is providence though, it also didn’t bring an exceptional amount of gravitas to the table. Instead, it brought a reputation for unreliability. That just added to its station along the automotive spectrum, and doomed its $5,495 price to a 60 percent Crack Pipe loss. Few of us know how old we will eventually get, but I think it safe to say that most—if not all of us—hope that the answer is “pretty damn old.” In automotive terms, today’s 1973 Jeep J4000 is pretty damn old, and its ad notes that its unique features were added by an owner who, at 82, was himself likely on life’s downward slope. The thing of it is, you’re only ever as old as you feel. That means that this Jeep and its owner/builder both likely belie their years. The ad claims that the lightly modded long bed was built by the octogenarian to cruise around Baja California. That doesn’t exactly sound like something old people or old trucks do on the regular. To that end, the Jeep has been imbued with what’s described as a “professionally built” 360-CID V8 with a 4BBL carb. The 360 was the last V8 engine in the AMC line, serving in the Grand Wagoneer well into the era of Chrysler’s ownership. It was also used in the 1974 Bricklin SV-1 which is a fun fact should you be needing to arm up on your party conversation fodder. The V8 is said to sport “special heads, cam, ceramic headers and special exhaust” among its arsenal. Behind that sits a GM THM400 3-speed automatic which sends power to a Dana two-speed transfer case and live axles at both ends. To ensure any Baja tomfoolerey doesn’t get cut short, the truck has also been provided with a cage in the cabin and a 54 gallon gas tank at the head of the bed. At the present average price of $2.269 a gallon for regular, it would take over $122 to fill that. I would imagine that, at around 6.3 pounds per gallon the over 350 pounds of fuel riding so high in the frame would also affect the truck’s handling and braking. Before we get to its driving behavior, let’s have a look and see if it’s even worth clambering into. The truck is the long-bed with a 132-inch wheelbase. The green paint looks as though it was applied with a rattle can or maybe a roller, but it’s serviceable. Two areas of primer on the hood are evidence of where louvers have been cut in. All the badging seems intact and there doesn’t seem to be any evidence of major road rot or accident damage. The cabin is beige which was likely the truck’s factory hue. Seats out of a later Jeep bracket a small center console and there’s carpet on the floor for you posh types. The steering wheel looks a little worse for wear and the knob on the end of the column shifter has gone rogue. Deist four-points with a quick release keep you from getting tossed around. The wheels are deep dish utilitarian units like you might find on a trailer rental, but seem perfectly at home here. One, the left-front, shows a sizable bend in its lip. The tire still seems to be holding air, but I’d have that looked at. The tires themselves are big knobby deals that don’t look too old. All in all, it seems pretty rough and tough, and something that could overcome almost any obstacle you could put in front of it. Well, I’m going to throw one down that you might not want to tackle: this truck’s biggest potential flaw is that it has a salvage title. That’s a big deal to some—my insurer won’t touch rebuilt title vehicles at all—while it may be a non-issue for others. Regardless, we need to take that into consideration when we contemplate the truck’s $5,990 price tag, which we’re going to do right now. What’s your take on this old Jeep and that price? Does that feel like age has its virtues? Or, does that, and the title, make you think this J4000 should go quietly into that dark night? H/T to Ian Inman for the hookup! At $5,495, Is This 2000 VW GTI VR6 a Hot Hatch You Could Warm Up To?